General Mattersrevolutionize the dispensation of justice in the country and to promote the welfare of the marginalized. On 25 November 2014, the Chapter joined the IBP National Office in celebrating the International Day for Elimination of Violence Against Women by participating in the Philippine Commission on Women’s “Walk to End VAW” at the Quezon City Memorial Circle. Lawyers from the Chapter volunteered to set up and man the IBP National Office’s Public Service & Crisis Center for the accommodation of legal inquiries and the extension of assistance relating to the protection and enforcement of women’s rights. In October 2014, the Chapter was invited by the IBP National Office to participate in a consultation/dialogue on the issues related to the implementation of Republic Act No. 8552, otherwise known as the Domestic Adoption Act. The consultation/dialogue was sponsored and organized by the Department of Social Welfare and Development. The Chapter also joined the IBP Southern Luzon Regional (“SLR”) Convention held last July 24 to 26, 2014 at the Bellevue Hotel, Muntinlupa City. On the first day of the SLR Convention, Chapter President Bienvenido I. Somera, Jr. served as one of the designated reactors to the panel discussion on innovations in the judiciary and in the prosecution of criminal charges. The following day, IBP Makati lawyers actively participated in the fun and games during the SLR Sportsfest, one of the main highlights of the Convention. Chapter Director Atty. Juor Buted also volunteered to act as a moderator during the plenary session which was held on the last day of the SLR Convention. During the third trimester of 2014, the Chapter conducted an internal review of its policies in accepting legal aid cases, in furtherance of its goal of extending efficient legal assistance to indigent but deserving litigants. In this regard, the Chapter is currently examining a proposal to limit legal aid cases to more pressing controversies, particularly those which involve the imminent deprivation of the liberty and property of indigent litigants. In order to be able to accommodate more cases of this nature, it was proposed that controversies which involve purely commercial or corporate matters be excluded from the new legal aid cases to be accepted by the Chapter. The Chapter also advised its legal aid volunteers to take up a merit-based approach in evaluating legal aid applications to dissuade applicants from taking advantage of the Chapter’s limited resources to file cases out of retribution, and not to obtain justice. The Chapter, in partnership with the Eco Divers Association, spearheaded the 2014 edition of the “Lex Aqua Underwater Coastal Clean-up Drive” held on 13 December 2014 at Balayan Bay, in Brgy. Anilao, Mabini, Batangas. With the full support of the Local Government of Mabini, Batangas, IBP Makati lawyers led the collection and proper disposal of garbage strewn along the coast and seabed of Balayan Bay. This environmental project sponsored by the Chapter is now on its second year. In September 2014, the Chapter was also invited by Magsaysay Shipping Lines (“Magsaysay”) to conduct a tree planting activity at Corregidor Island. Magsaysay is currently setting up a bird sanctuary within the island and the proposed tree planting activity is intended to complement the aforementioned project. The Chapter’s Developmental Legal Aid Committee is presently coordinating with Magsaysay on the implementation of the proposed tree planting activity. On 12 December 2014, the Chapter participated in the briefing conducted by Justice Roberto Abad and The Asia Foundation on the piloting of the Proposed Rules on Civil Procedure in selected Makati City and Quezon City trial courts. The piloting of the Proposed Rules is scheduled to commence in February 2015. In this connection, the Chapter committed to provide volunteer lawyers for the Pre-Pilot Seminar Workshop to be conducted by The Asia Foundation on January 28 and 29, 2015. The IBP Makati lawyers participating in the said workshop will be assisting Makati City trial court judges in testing out the Proposed Rules prior to their implementation in selected Makati City trial courts. To augment the Chapter’s efforts in streamlining its policy in handling legal aid cases and to assist in unclogging trial court dockets, the Chapter’s Bench and Bar Committee is presently coordinating with the Public Attorney’s Office of Makati City (“PAO Makati”) for the assessment of a proposal to refer legal aid cases to PAO Makati for mediation and conciliation. The proposed referral of legal aid cases to PAO Makati is intended to identify, from the outset, those cases which are susceptible to resolution by mediation and conciliation in order to discourage the further litigation of such cases before the trial courts. The Chapter’s Legal Education Committee is currently organizing a series of Mandatory Continuing Legal Education (“MCLE”) Seminars for the Fifth (5th) Compliance Period of the IBP National Office’s MCLE Program. The Chapter’s MCLE Seminars will be headlined by a selection of the country’s best legal minds who will be lecturing on the most compelling and relevant legal subjects to date. The Seminars will begin on 23 January 2015 and will be held weekly, every Friday, until the 13th of February 2015 at the A. Venue Suites, Makati Avenue, Makati City. Further details on the Chapter’s 2015 MCLE Seminars are available at http://www.ibpmakati.com/ - the official website of the IBP Makati. On 21 December 2014, the IBP Makati donated books to the children of Brgy. Kay-Anlog Resettlement Site in Calamba, Laguna for the Chapter’s 2014 Gift Giving Project. This small donation would hopefully contribute to the resettlement community’s efforts in stocking their small library and play area with a wider selection of reading materials. 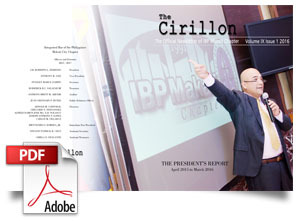 In November 2014, the Chapter released the fourth issue of The Cirillon, the IBP Makati’s official newsletter. Entitled “IBP Makati Gives Back”, the fourth issue of The Cirillon highlighted the Chapter’s fund-raising activities and rehabilitation efforts during the second trimester of 2014 which were organized for the benefit of the victims of Super Typhoon Yolanda. On 05 December 2014, the Chapter held its annual Christmas Party at the Bravo Restaurant along J.P. Rizal Avenue, Makati City. Hon. Selma Palacio Alaras of the Regional Trial Court of Makati City graced the event and shared her time in discussing the Jail Decongestion Program being proposed to be undertaken by the Chapter, with the blessing of Makati City trial courts. For more details on the events and activities organized by the Chapter, kindly visit http://www.ibpmakati.com/ - the official website of the IBP Makati. “IBP Makati Chapter”, the Chapter’s official facebook page, is also available for viewing by both members and non-members. This concludes the Chapter’s report for the third trimester of 2014. Should you have questions regarding this report as well as the Chapter’s projects and activities, please do not hesitate to contact us.